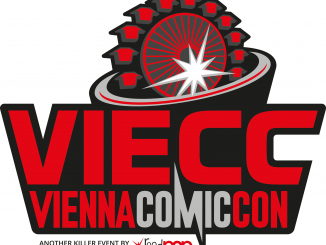 Ever wanted to own a comic that’s not just a comic? 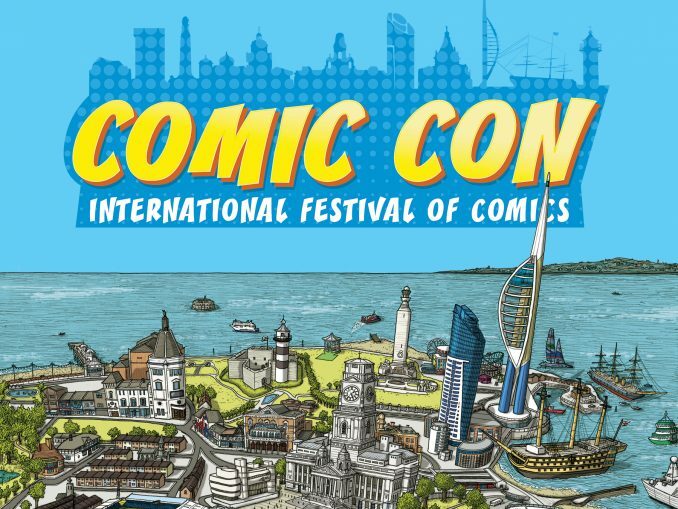 A comic that touches another iconic American phenomenon? 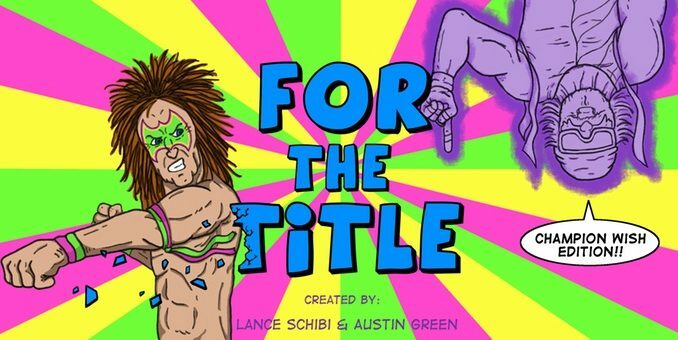 FOR THE TITLE is a unique webcomic mainly about wrestling with an interesting storyline and great guest artists. 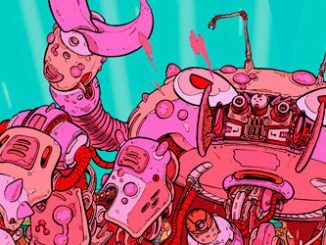 I cyber-sat-down with creators Lance Schibi and Austin Green for this unusual 5+1-Q&A as they are Kickstarting the print version their book right now with some very cool rewards! 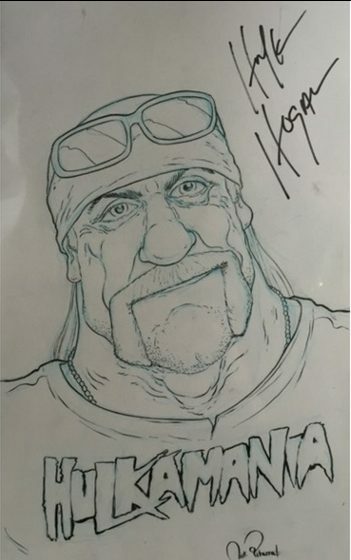 Ever wanted to own a painting of Macho Ghost? Or be immortalized as an original Garbage Pail Kid by Nick Pitarra? 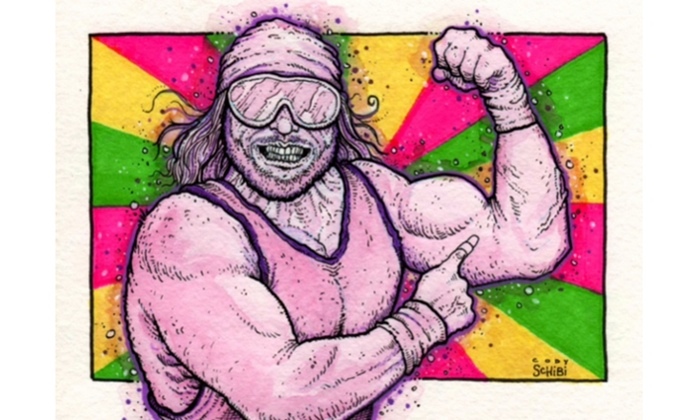 Or own an original pocket-wrestler watercolor by Cody Schibi? Yes, you did! 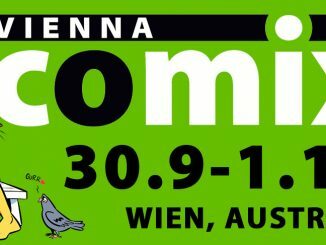 Milán Kovács (Comic Conventions): Okay then guys, let’s state the obvious here, I haven’t read a page or even a panel of this webcomic. I hope that won’t be a problem as I already backed the project and will be reading it in a nice, printed form. I bet you guys are massive wrestling fans. I’m from Europe so we don’t see much wrestling here. Though I liked it as a child watching it on TV nowadays I’m not up-to-date. I can say I quit when Hulk Hogan did. Or did he!? So the obvious question here is, why? 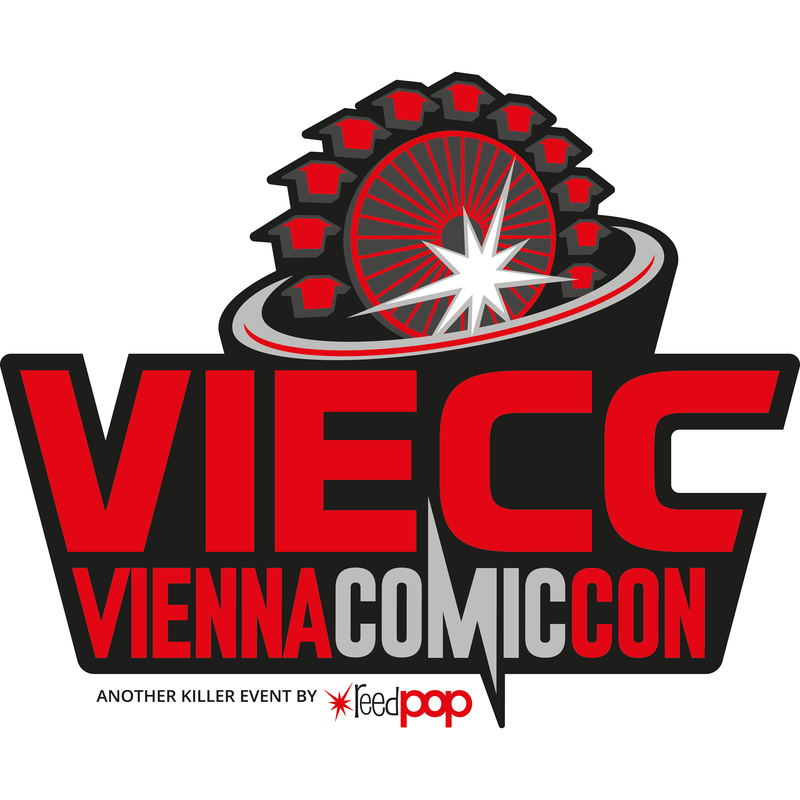 Why a fan, why the theme of the comic? Lance Schibi: Like you, I grew up watching WWF and stopped following wrestling before Stone Cold or The Rock started wrestling. I’ve tried watching wrestling nowadays and, although it’s fun, the goofy characters and 80’s glam-rock vibe is missing… So I don’t find myself as captivated as I once was. Granted, I was a kid full of wonder so it’s probably something that will never come back for me but I’ll always remember and be a fan of the off-the-wall antics of those late 80’s wrestlers. Since Austin & I both knew the characters from the WWF wrestling-era so well, it was really easy to create a world around them. But the idea for the web comic and story came around as a joke. We used to work together at a desk job and I’d doodle all the time on a dry-erase board we had. One day I drew this gnarly skinny guy with a long beard and long hair, crazy fingernails and toenails – just a gross character – and I ended up putting Warrior face paint on him. 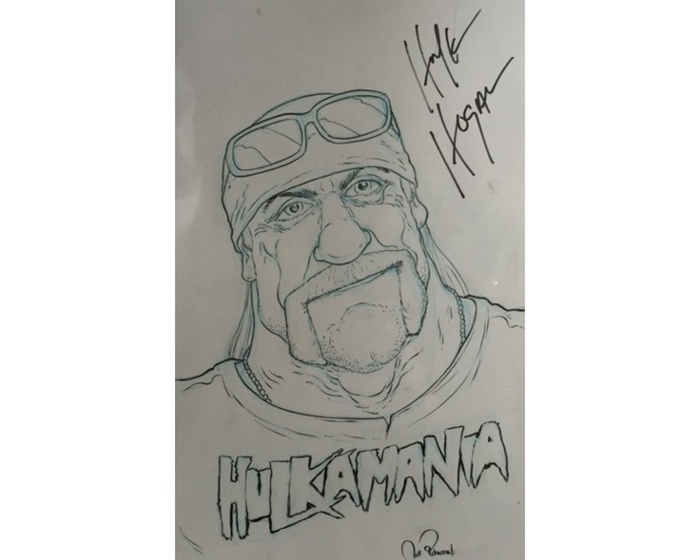 So that led me to draw a huge Ho Kogan, wearing a MANIA shirt, and having the head the size of his torso. He had a champion belt tucked into his underoos and was obviously ready for business. The sketches stayed up there a few days and we bounced ideas off of each other and came up with this ridiculous story of Macho Ghost. We’d wanted to create and work on something together for awhile and we just ran with this idea. Lance Schibi – own a wrestler! 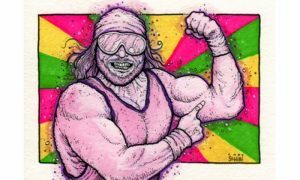 Austin Green: What I remember even more from the wrestlers I watched growing up in the 80’s and early 90’s isnt the wrestling, it was the characters they played. The actual wrestling was really secondary to me. They were real life cartoons! 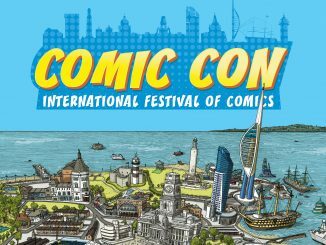 Real life comic books! One of my favorite parts of writing this webcomic is taking these familiar characters and putting them in places or situations we haven’t or wouldnt see them in before. I like to think of it as almost a Saturday morning cartoon in webcomic form. Each volume can be looked at like its an episode. What I got from the description of your Kickstarter – which is successfully funded already with some nice stretch goals like upgrading to a hardcover – ending in 10 days is the comic is about Macho Ghost. Who is this guy exactly? Please tell me either of you cosplayed/will cosplay him at one moment in your life! AG: Most of the backstory here is pretty vague on purpose. You don’t need to know much about what happened beforehand. Just jump right in and go along with the ride. A lot of fun we have with the webcomic is showing new aspects of this world that are just super normal to the characters in it, like referees appearing from almost anywhere if a match is about to end, or really random and maybe even conflicting rules on challenging people for titles. We like it this way. LS: Macho Ghost is essentially every ghost wanting to come back to life. They do exist and are out there. Maybe there’s a reason he wants to come back to the world of the living as flesh & blood, but there’s this unknown burning desire to come back to life. He’s really just this generation’s Casper. As far as cosplaying Macho Ghost, I haven’t yet but I’ve come pretty close. Macho Ghost has this purple glow or aura around him and my friend, Nick Pitarra (one of the guest artists! 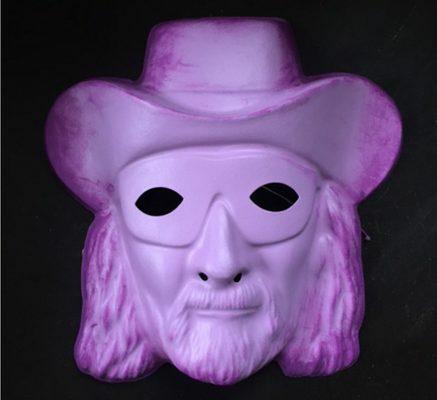 ), actually bought me a Macho Man shirt that just happened to be a similar shade of purple. 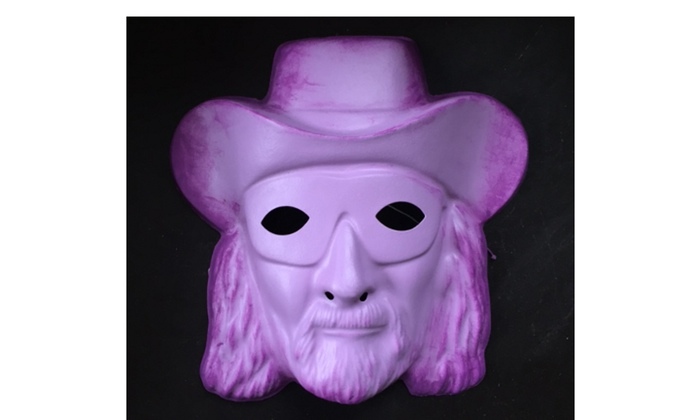 I’ve made a handful of those old vintage Halloween masks of Macho Ghost (which are on the Kickstarter as rewards – but all out!) and painted them…but check out the profile pic on our Kickstarter site. That’s me morphing into Macho Ghost. It’s the closest I’ve come to him so far but I would LOVE to see someone walk up to me at a convention in a FOR THE TITLE cosplay. If a cosplay ever happens it would probably be me or Austin dressing up. Cause that’s how we represent. I saw there are some great rewards at the more affordable pledge levels like original panels and even watercolor paintings from you, your brother and other notable artists too. Did you have to wrestle them to cut their prices or just simply threaten to cut their fingers otherwise? LS: I basically stole all their original art and they have no idea that I’m using them for this Kickstarter. Not really. Every artist that has worked on FOR THE TITLE has been extremely cool about everything. When I first approached them to do a single panel, they were all stoked and willing to do it. The same went when I told them about the Kickstarter idea and they wanted to offer up any originals they had. A lot of the artists draw digitally so there aren’t panels from all guest artists but every single original piece of art on the Kickstarter was donated to get this book funded and printed. Everything was priced affordable so not only would this help reach the funding goal, but would allow backers to own some really awesome art at a great price. There’s also rewards to work directly with artists for commission pieces. Nothing cooler than telling an artist exactly what you want them to draw. AG: I gave serious thought to just buying all the guest panels for myself. I think the people who pledge at those levels, or who have already pledged, will be surprised when they get the original art in. Seeing the images on your computer doesn’t do them justice. They’re all SO rad. Lance, who is this other fella stealing your family name Cody Schibi and what does he have to do with the comic or stealing your name? LS: Cody is actually my twin brother who draws like a maniac. He did a few guest panels for the web comic and we always find ways to work together on projects. We typically table together at any conventions we do and we like to deliver Schibi Sandwiches™ to passersby. We actually have a gallery show coming up later this year in Texas so we’re planning and really looking forward to that. I doubt there will be any FOR THE TITLE pieces in there but who knows! But yeah, Cody definitely stole all my looks and talents because I was born 3 minutes before him so… freakin’ copycat. LS: I really wish we could say we planned something like that but just getting this thing together was exhausting so there’s no great celebration in place at the moment. Boring, I know. We have been approached to do some book signings which we’ll definitely do but it would be really cool to have some sort of WE’RE FUNDED!-party. But all the backers are literally from all over the world at this point so it wouldn’t benefit anyone but those in town. But once the Kickstarter ends, my main goal is to just get everything together as quickly as possible… you know: print the books, print the stickers, get the buttons made, get all backers in contact with their artists for custom art, get everything ready for shipping… all of that… just so everyone that backed have an awesome experience and stuff in thier hands as soon as possible. Once we have everything though, I can totally see putting together some sort of launch party. I think Austin should plan all that. Lastly is there anything else you’d like to say about your Kickstarter campaign? I hope there is as I’d really love this to be a hardcover so we really should walk past that $5500 stretch goal! LS: I’d first want everyone to know who has backed or shared the Kickstarter link just how much it means to us. I receive email notifications as soon as a pledge comes in and I’m blown away everytime I open and read them. But yeah, we still have a little over a week left and I would absolutely LOVE to make this book as a hardcover edition. That’s my Champion Wish. I’m already stoked that the book is actually happening but everyone out there DESERVES a hardcover edition. So if you’re reading this, check out all the rewards on the Kickstarter page because there’s still a ton of original art available. If you’re not a fan of wrestling at all, this story is so much more than just wrestling… it covers love, heartache, betrayal and everlasting friendship. Also, if you like Andy Kaufman or Jim Carrey, you’ll love this book. Follow your heart on this. AG: We’re absolutely blown away by the amount of people that have already pledged to back the Champion Wish collected edition of FOR THE TITLE. Not only have we reached our initial goal, but we also hit our first stretch goal. Everyone who pledges at a level high enough to get a copy of the book will also be getting a sweet HOT! 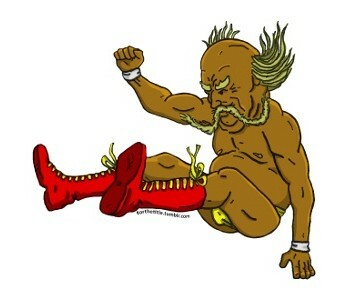 button (which you’ll understand as soon as you see it), along with a vinyl sticker of HO KOGAN doing the baddest leg drop ever seen! 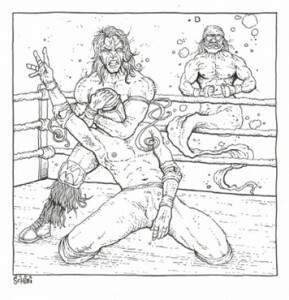 Hitting the hardcover goal would be icing on the weirdest, wrestling related webcomic cake anyone has ever seen. Like Lance said, follow your heart on this. 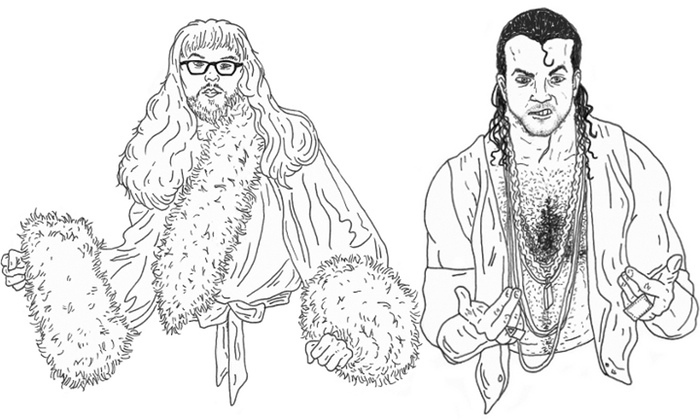 Believe in MACHO GHOST.